"She has not opened her eyes in days. I know that she is still conscious because I hear her screams every time they prick her with those needles. I don’t know if she feels anything else other than pain. All I know is, time to save her is slipping away. We have just a week now." 11-year-old Yuvasree is known as a very mischievous young child. Her energy lit the room up everywhere she went. Her parents did not notice when her enthusiasm hid her illness. Finally, jaundice took over her body until her liver was completely damaged. If Yuvasree does not get a liver transplant within the next week, she will not survive. 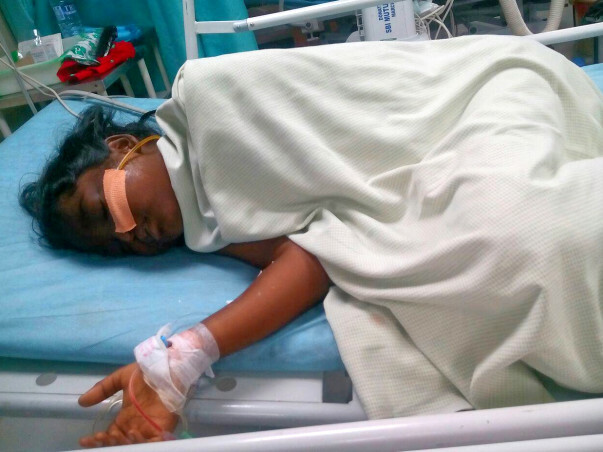 Mahendra and Ramani, the parents, are in complete shock over their daughter’s condition. The parents are unable to even talk to anyone, constantly breaking down if they even try to explain. Ramani’s brother, Nagaraj has been a pillar of support to the family and has been running around these past few days trying his best to keep Yuvasree alive. Yuvasree was diagnosed with acute liver failure upon arrival. Her face, hands and legs were swollen. Her blood was affected and liver was completely damaged. She needed an emergency liver transplant to survive. Her mother was identified as a perfect match to donate a portion of the liver. This did not solve anything. Mahendra is a driver with Sankara school, and his wife Ramani works as a maid. They live with their 13-year-old son Josin and 11-year-old daughter Yuvasree in a humble home. Together, they run the household on Rs. 18,000 income. The pre-transplant work-up has cost the family around Rs. 4 lakhs, and the expenses for hospitalization is almost Rs. 30,000/day. Mahendra has exhausted all resources, and though everyone is trying their best to arrange funds, they have run dry now. 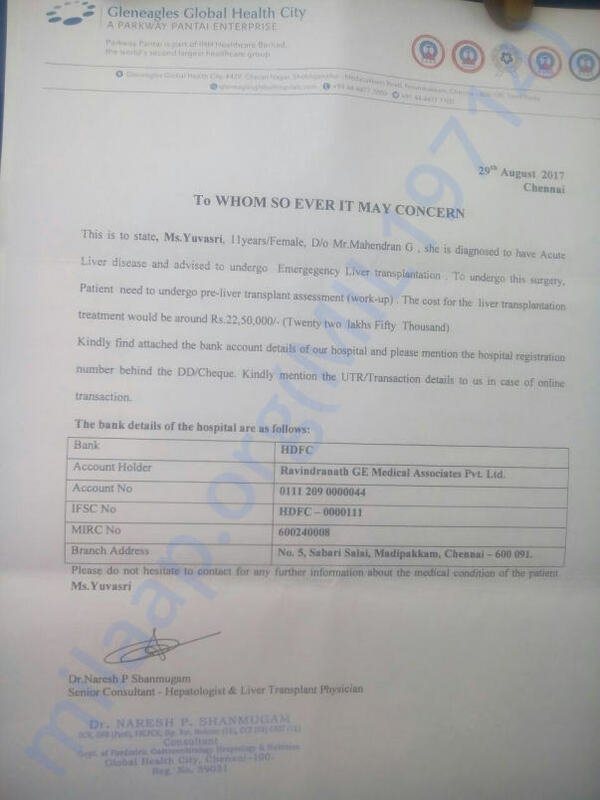 Yuvasree’s transplant is estimated to cost Rs. 30 Lakhs. The family must prepare themselves for the worst if this goal is not met. 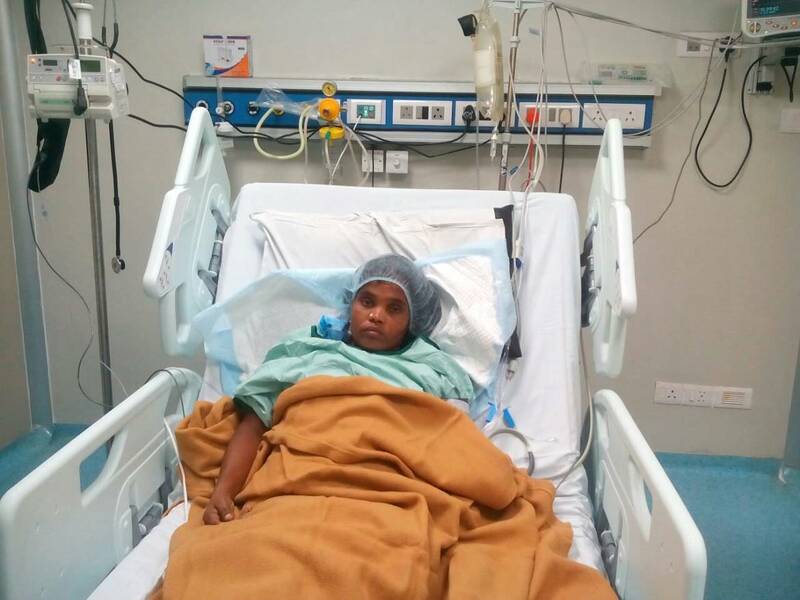 Your contribution can save 11-year-old Yuvasree from losing her life to poverty. She has a week left to live. Here's a quick update on Yuvaree. She is currently at home and is doing better. Her visit to the hospital is planned on 2nd of November. Post her follow up with the doctor, doctor will decide the further course of action. Thank you once again for your love and support. Keep praying. Here's a quick update on Yuvasree's health. Yuvashree is doing well. 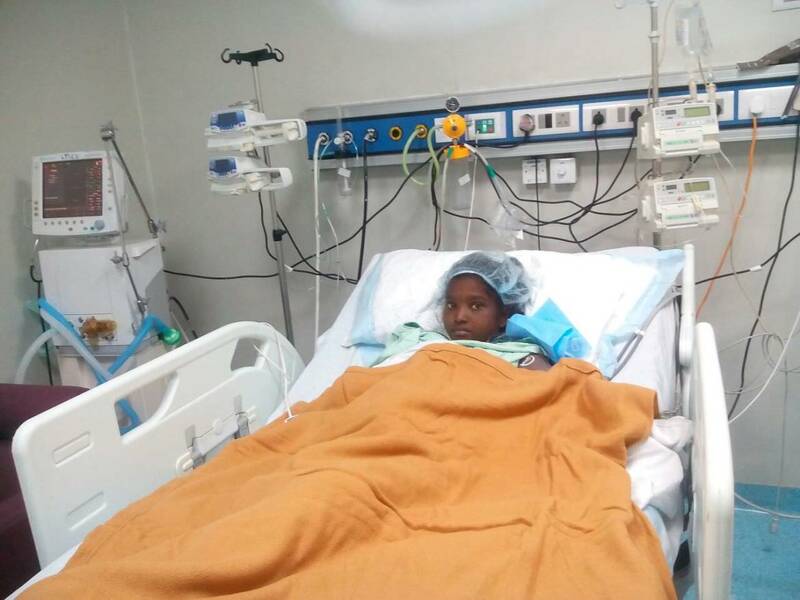 There were no complications so far after the transplant, also she has been coming for routine check-ups and everything seemed to be normal. She's living a normal active life like any other kid of her age. Thank you so much for the love and support which you have shown towards her, May God bless you all! Yuvasree underwent liver transplant successfully on 9th September. She is stable and has been shifted to the ICU. 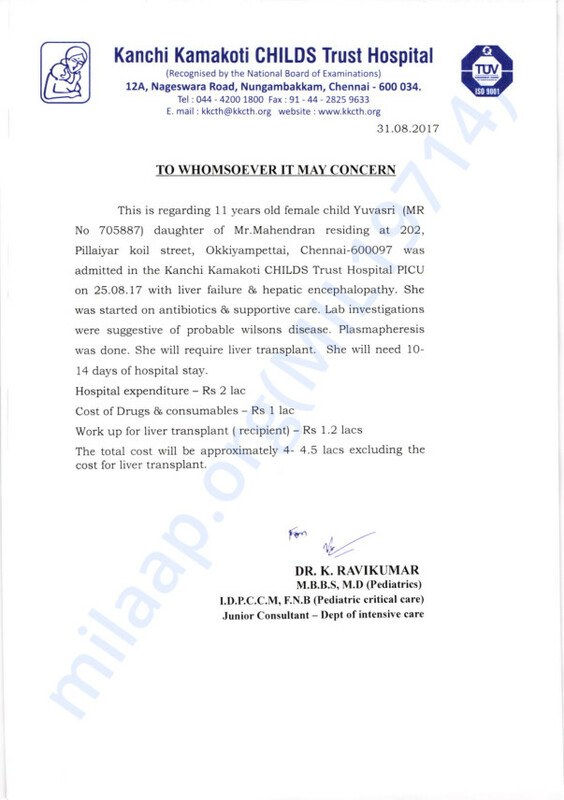 Her mother Ramani donated liver. We are thankful for your timely support to help this family. Here are photos of Ramani and Yuvasree.